In 1999 Mr. Lesley traveled to Glenrose, Texas and met with the Emmit McFall family. Mr. McFall and his wife owned land upon which fossilized, intermingling footprints of dinosaurs and humans were found in the 1940s. This is one of the creationist contributions that continues to ripple through time. Mr. Lesley interviewed Mr. McFall and his wife on video on their front porch. They directed him to what is now known as the McFall Site and the Taylor Trail, a fossilized crisscross pattern of human and dinosaur footprints in the same rock layer – a discovery highly regarded as physical proof that humans and dinosaurs coexisted. There, Mr. Lesley met and interviewed a young Aaron Judkins, then and up-and-coming Biblical archaeologist. To help better illustrate the historic significance of the Taylor Trail, Mr. Lesley suggested that Mr. Judkins fill the tracks with water to make them stand out visually, stand at the end to clearly show that one track was in fact made by a human, and have a photographer snap the image from atop a ladder at the beginning of the trail. A week later, Mr. Lesley received several copies of the resulting photo, which has since become an iconic image in the Creation and archaeological communities supporting the theory that humans and dinosaurs shared the earth at the same time. 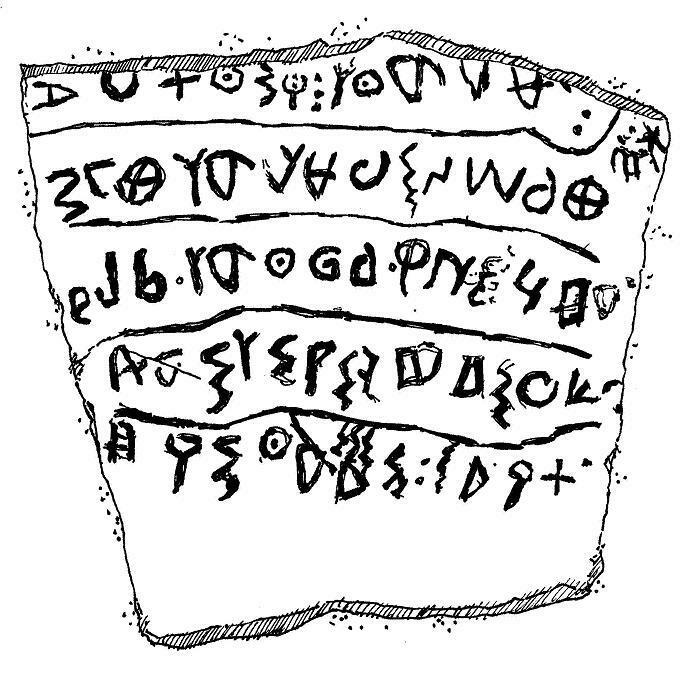 Another icon of the coexistence of dinosaurs and man is the Granby Stone. 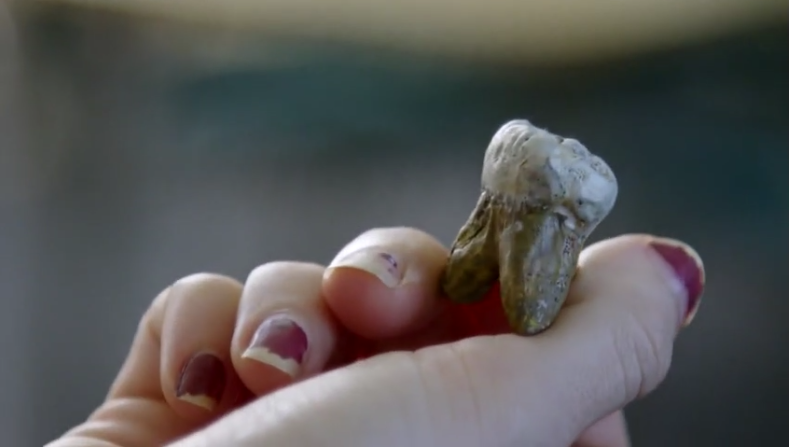 The stone was found by farmer Bud Chalmers in a dried lake bed in the 1920s. Mr. Chalmers kept the artifact for three decades, then sold it for 4300 to a Mr. Knight, purportedly the curator for a “museum out East.” Mr. Chalmers released the artifact in good faith, believing that it would find a rightful home in a reputable museum for the world to see. 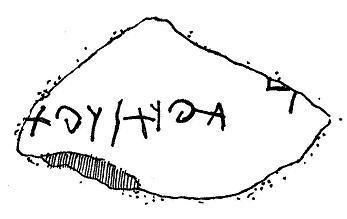 Unfortunately, research shows that the mysterious Mr. Knight had used a false name and the Granby Stone disappeared. Though it has never been located, Mr. Lesley has faithfully replicated the Granby Stone using photographs taken before it vanished. His sculpted artistic replicas now are showcased at four Creation museums in the United States and Canada. In 2012, M r. Lesley also introduced two largely unknown icons as evidence of the existence of the world’s most famous Nephilim, Goliath. 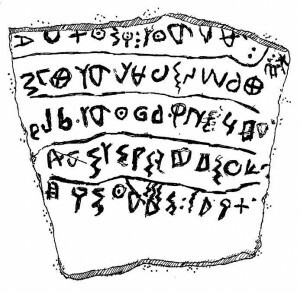 These are carved inscriptions found on clay tablets in Israel that include Goliath’s name. 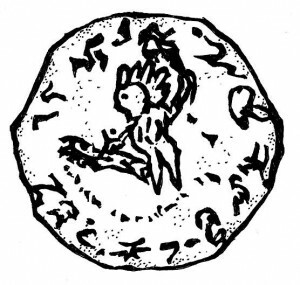 Other direct evidences for giants have been replicated and are being introduced through the Lovelock Pestle, the largest known pestle in the world – far too large and heavy for any single person of today’s stature to use….
. . . .And through ancient machining techniques demonstrated in images seen on the Lawn Ridge Coin. These items and many more are available via purchase or trade for Creation institutions to display. The Nevada shoeprint, found January 15, 1017 mentioned in the New York Times and the New york Sunday American, this oopart was well documented but like most evidences against the exaggerated timelines, it was unprofessionally and likely and intentionally lost and/or destroyed. From multiple photographs and articles about the item I was able to make a very exact reproduction including the double stitching. Welcome back! Left: The Pterasaur Effigy is an example of dinosaur archeology. 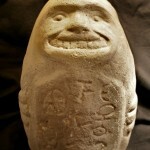 This Ancient Native American Effigy was found in Arkansas. In this ancient artifact is the profile of a flying dinosaur’s head. A circular carved eye is clearly seen. There is a brow, skeletal features, lower jaw and even scales on the neck areas. The creature this image represents is a Pteradactyl . 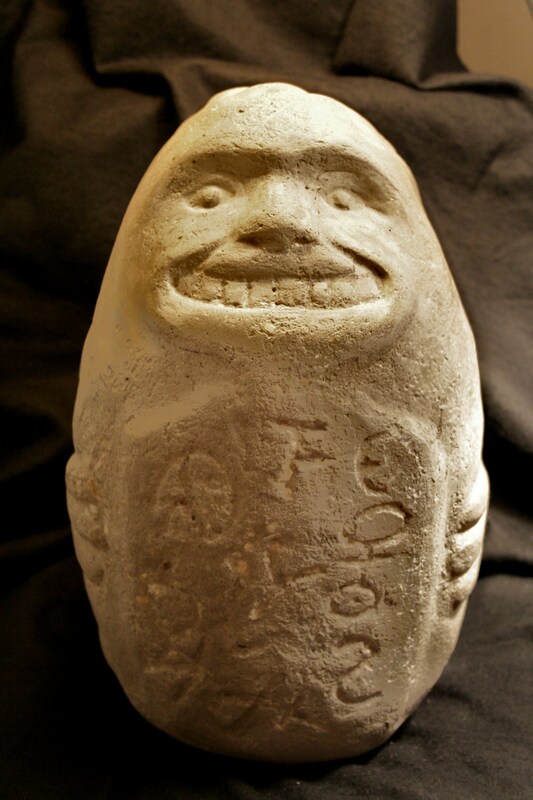 This is one of the acquisitions of genuine artifacts owned by GAWM, and available to the public. (above pictures are replicas). Middle and right: These are replicas of Acambaro pendants of a stegosaur-like dinosaur. Examples of dinosaur archeology is almost unavailable outside the immediate region. These have now been made available to the public and to Creation organizations. The Caria Stegosaur: a terracotta statue of a dinosaur/sauropod with plates on its back. The plates are triangular, and continue along the back until reaching the tail. 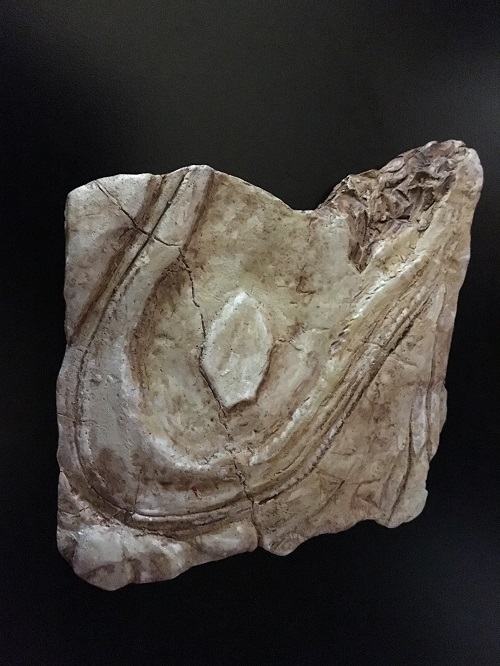 It becomes clear immediately that the animal represented in the sculpture belongs to a species of stegosaur,– a species of dinosaur with plates on its back;– This “ITALIAN” artifact has been carefully measured and reproduced to show that dinosaur archaeology is not limited to Ica, and Acambaro. Many people took part in the show Search for the Lost Giants, and i wish i had more skin in this game. This was paid for by Jim and Bill vieira. Hugh Newman worked with them closely in which they also produced an awesome flavorful book. Early on: Jim Vieira contacted me on this website, and Micah Ewers was recruited to help with their research. Micah of course is an amazing researcher who didnt get as much credit as he deserved, he did get paid, but much of the work we did was free and without asking for anything so I really have no idea how much research came from this site, or how much i shared with Micah Ewers and then later ended up with the Vieira’s and Newman. The truth is there was so much free research put out there i don’t think anyone knows. The percentage that was contributed from this site; who had my full permission, or which passed through Micah doesn’t really matter. I know myself and many others had a small unknowable portion of their success. I am thankful to have participated and contributed to this documentary. December 25th 2018, Christmas morning the best gift i could have received. 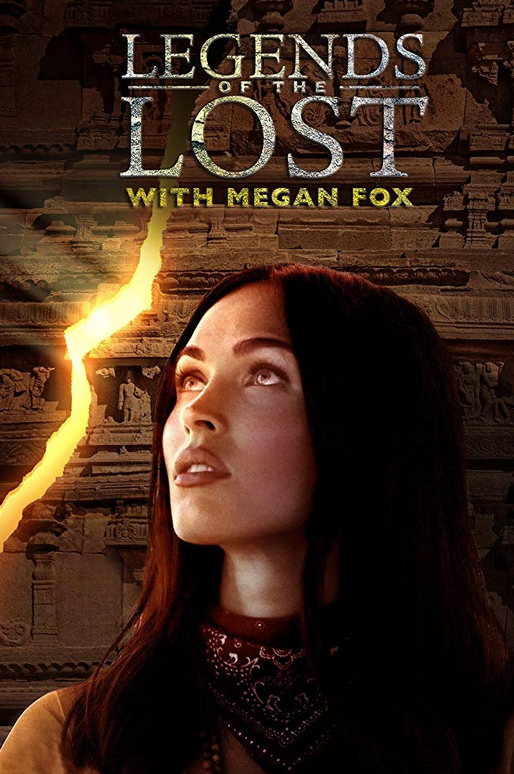 On the Travel Channel: the Legend of the Lost series Megan Fox is handed a tooth of a Denisovan by Jim Vieira.